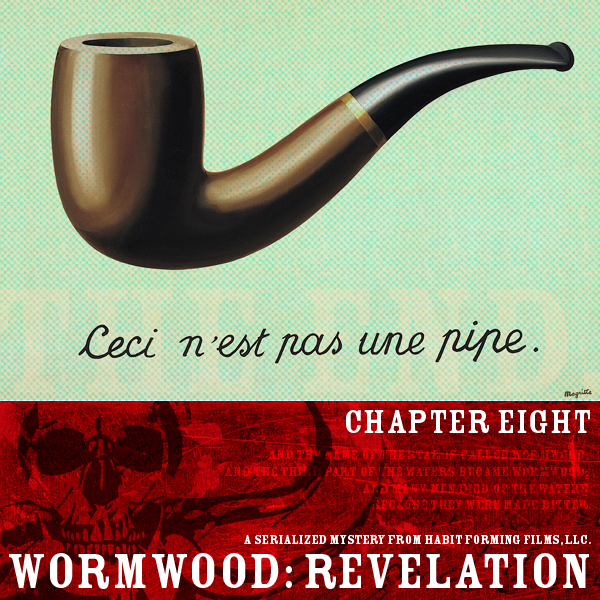 Habit Forming Films proudly presents: Wormwood: Revelation: Chapter Eight! with a special appearance by Peter Dirksen as Jimmy Details. Additional songs “Slave” and “Thin” provided by Absent Me. Copyright 2010 Habit Forming Films, LLC. All Rights Reserved. This entry was posted by Wormwood on Tuesday, September 28th, 2010 at 11:50 pm	and is filed under podcast, season 3. You can follow any responses to this entry through the RSS 2.0 feed. You can leave a response, or trackback from your own site. Such an amazing series. Thank you for all of the time and work you have put into this. Would it be at all possible to get the score for the series. The music and Crowe’s accent/VA are what originally made me love the series :P.
Great choice in the cover art for this episode. I can’t believe it’s over. What a journey! Do you have other story lines in the works? Bravo! Thank you for a fascinating story and characters! I’d love to see it made into a movie! Any chance of that happening? I hate that it is over but look forward to post mortem shows. And maybe new adventures for Dr. Crowe and Sparrow? Please, please, please!!?? I’m so utterly dissapointed. Wormwood seasons 1 and 2 spun this great mystery and interesting characters, and so much amazing plot, but we get to season 3 and it started off pretty bad. kept going and it seemed to get worse. the writing was well done, the acting was great, and the audio was way more balanced then previous seasons, but it lead to nothing. the characters all just kind of die, without meaning, or end up being left in a bad position and nothing done about it. even Diedre’s character seemed to die for no real reason. i get that happens in horror but wormwood seemed to have meaning in every step it took. i feel like the finale of the first season of heroes. we got a great story and so much effort put in to it, all just to make it to an ending that didnt really need to happen, and wasnt as great as we thought it would be. i feel like these characters were destined for so much more. im sorry if i sound harsh i really dont want to but it was so dissapointing. 🙁 im just really really sad. wormwood was one of my favorite shows and it just went nowhere. at least rachel got some semblance of an ending even if throwing her in to harmonys body was completely useless. Sorry it didn’t work for you, RJ. Obviously, we disagree. 😉 We don’t think it all led to nothing; after all, the world was saved from the hands of a demon. Crowe and Sparrow are both different — Crowe has had his personal demons exorcised. Jacob’s in a different place, as is Rachel (literally). Deidre’s arc surprised us, but felt like the right end for her. Jonesy rose to make his role meaningful. Even Grail grew through his interaction with Sister George, sacrificing himself to save others rather than follow orders. We end with Crowe and Sparrow in a new place, with Bradley and Drexall watching over their town, with Sister George and Elsa Bloomington embracing new roles. In the end, we felt we stuck to our story about the Object, and we told the tale of what it means, who is after it, and how the resolution changed all those involved. honestly though, first two seasons, great great great. in my imagination it ended after season 2. Thank you for this, really. I thought it was incredible, all of it. Unlike others, I enjoyed the beginning of season 3 and the shift in story-styles. Yes, I missed Crowe and Sparrow, but I loved the homages to styles of “Five Fingers” and most of the “Portraits” were great insight into the other characters. In the end, the wrap-up? I don’t know, I enjoyed it all, mostly. I had trouble with Diedre and mostly with Sheriff Bradley and the chopping up of the “kid.” Ick. Really a sound effect I could have done without. I like how it all came together, and it was really Sparrow’s story in many ways. I appreciated that Sparrow’s one “little” change was to bring back Jimmy D.,but that’s also where I didn’t like it. The end was too much “Oh, here we go again, it ain’t over yet.” (And while I don’t want it to be *over*, I love this world you’ve created, I didn’t like the “obvious sequel” feel of the last 40 seconds or so. That said, I’m waiting for what’s next. Thanks, all. Thanks, JesterEric! Glad you enjoyed our various entries for Season 3. From the creative side, we were definitely invigorated by the shift and the ability to do the Five Fingers stories, as well as the Portraits. As for the “post credits” scene at the end? Well, yeah, that was admittedly more of a gag than anything else. If it helps, the true story of Wormwood ends with the final credits. Anything after that is just… speculative…? wonderful wonderful wonderful! Parts of this one brought tears to my eyes. A great ending for a great story. Thank you so much for many man hours of enjoyment. Oh em gee – what a finale, you guys. Totally pimpin’ to as many friends as possible. Any news on a sequel? I’d love to see (or rather, hear) of more Crowe and Sparrow, but of course, I leave it in the capable storytellers’ hands. 🙂 Thank you for giving us such a great ride. I was searching for another audio story after just finishing the ‘We’re Alive” and the ”Infected” series, and happened upon Wormwood. I must tell you that I truly enjoyed this project. The acting, and writing was great. My favorite character was Deputy Drexel. Special Thank you to Dave Johnston for bringing to life Deputy Drexel with your superb acing skills. Gotta love it! I’m late and don’t know if anyone still checks the site but I had to post something as sort of thank you. I’ve had a life changing past 3 weeks, filled with stress, life “do overs” and all sorts of problems. It’s coming to an end (or new beginning), but when it started I was looking for something to fill the silence. That’s where Wormwood came in. I cranked through this during some of the hardest days of my life and it kept me going, entertained and sane. Thank you Wormwood for the show, I’m now re-listening from the beginning after SUCH A REWARDING CONCLUSION! You guys saved me from madness, by giving me some madness. Oh my god the past days/week at work have been an adventure listening to this. From the season 1 and 2 cliffhangers to the season 3 finale I was completely hooked and days were going by in what seemed like minutes. Also, just to clarify about the post-credits “gag” part: Him just starting to sing from [REDACTED FOR SPOILERS] just completely [REDACTED FOR SPOILERS], right? I’m 99% sure that’s how it was “supposed” to be interpreted but I’m never sure. Hahah — you nailed it, Scott! Sorry I edited your comment there, but I wanted to put some spoilers up for anyone happening upon your comment before listening to the finale. I feel like since I took the time to listen to this series (all over the past week and some days), I may as well add at least 1 comment to it. As many other commenters have echoed, I do feel like there were definitely some missteps in Season 3, though I wouldn’t go anywhere near saying it was “Bad”. Portraits I thought was fantastic, and 5 fingers was interesting. But once Revelations started, I felt like almost too much was tossed in at once. I feel like some of those plotlines could have been fleshed out over a longer season or even a 4th season and would have carried more weight for it. But I’m a writer, and I understand deadlines and output and all of that, so sometimes you have to fit what you want where it can be fit in. I just think putting so much into these 8 episodes left some things a bit vague, and kind of overwhelmed me with characters and plot points. The only really specific things that actually bothered me were the circumstances of Dierdre’s death (moreso it kind of happening tucked away without really affecting anything other than herself, and being a bit vague as to what exactly was happening physically with her), and the Rachel/Harmony possession from beginning to when Rachel left her. I feel like everything that happened in the end for Rachel was great though. Now, with those negatives out of the way, let me say that this final episode really felt like a great wrap up to everything, and left me with an overall good feeling about season 3 as a whole. We really got to close the gap on our understanding of Sparrow and Crowe’s relationship, and where everyone goes from here. It was a generally happy ending, and left some fun questions to think about as well. The gag at the end was a fun bit as well. All in all, I think you guys put together an amazing series, and despite any reservations I have it came to a very satisfying conclusion. If it wasn’t any good, people wouldn’t still be marathoning it as I am in 2016. You all should be really proud of yourselves, and I hope that some day one of you, or another writer delves back into the universe you created.